The Atheist says God is Love | i'm on an adventure! At the end of the summer I took this awesome course about relationships with Matthew and Terces, the founders of Cafe Gratitude (more info about what I took away here, here and here) and one of the coolest things they showed me is that God is love. I do not consider myself to be a Christian person and I often used to feel uncomfortable at religious gatherings or when people would talk about their concept of God. I have realized how limiting this is. When I do that I miss out on so much inspiration and there is a whole part of existence I cannot connect with. Love will keep you from all harm— love will watch over your life; Love will watch over your coming and going both now and forevermore. Love is a refuge for the oppressed, a stronghold in times of trouble. Regardless of your culture, age, religion or spiritual belief I hope we can all agree that love is a powerful thing. Go forth, love others. Slaves, obey your earthly masters with deep respect and fear. Serve them sincerely as you would serve LOVE. And she said unto him, My father, if thou hast opened thy mouth unto LOVE, do to me according to that which hath proceeded out of thy mouth; forasmuch as the LOVE hath taken vengeance for thee of thine enemies, even of the children of Ammon. Love is a powerful thing, but it never should be associated with something as poisonous as religion. The concept of a hell in any context is directly against Love or Forgiveness. 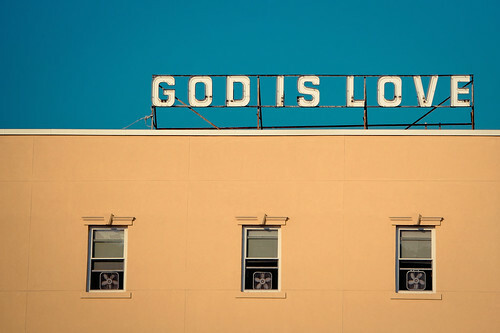 If God is Love, no one would be hungry or sick. If God is Love we would KNOW God in this life. I disagree that ANY passage in the Torah/Bible/Quran can be turned into something uplifting, but maybe psychopathic as I illustrated with the passages I chose. I vehemently disagree in connecting religious deities like Yahweh and Allah to concepts like Love when the characters are Bi-polar power crazed lunatics with no sense of responsibility. We have passed the infancy of the civilization process and we need to put concepts like religion behind us. They are not needed and are halting progress in many areas, like stem cell research and condom usage in Africa or the recent women’s driving ban in Saudi Arabia. Love can do work on its own. It doesn’t need to be dragged down by slick religions that hide their evil ideologies. Jesus was a cool guy tho, he didn’t do anything wrong… I think. Pingback: Psalm 30: the love edition « i'm on an adventure! There is no greater love that God sent his son Jesus to die for us while we were yet sinners. That is LOVE beyond measure and FYI, hell is real too.